We are excited to feature the NEW PGI Cobra™ BarriAire™ Gold Hood! Cobra™BarriAire™ Gold Hoods combine superior comfort, increased protection and maximum durability. 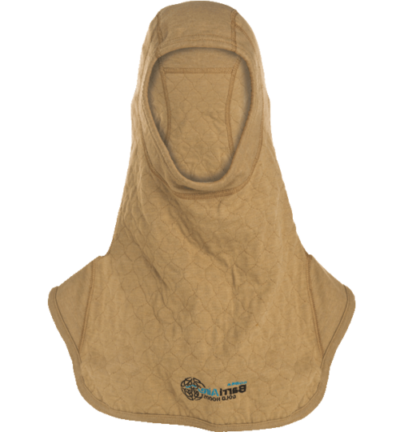 These hoods combine an outer layer of PGI proprietary gold FR fabric and an inner layer of ultra-lightweight, DuPont™ Nomex® Nano Flex fabric, which can inhibit penetration of many small size harmful particles. This barrier blocks 95% of harmful contaminants and potentially carcinogenic particulates .20 microns in size or larger. In addition, these hoods are not loud like PTFE laminated hoods, which can adversely affect a firefighters ability to communicate effectively and maintain situational awareness. Your fire hood is an investment in your health and safety — go for the gold, BarriAire™ Gold Hoods only from PGI!